We have received “Certificate of Appreciation” in recognition of valuable supporting to Internship program of Final Year Students from University of Computer Studies – Yangon. 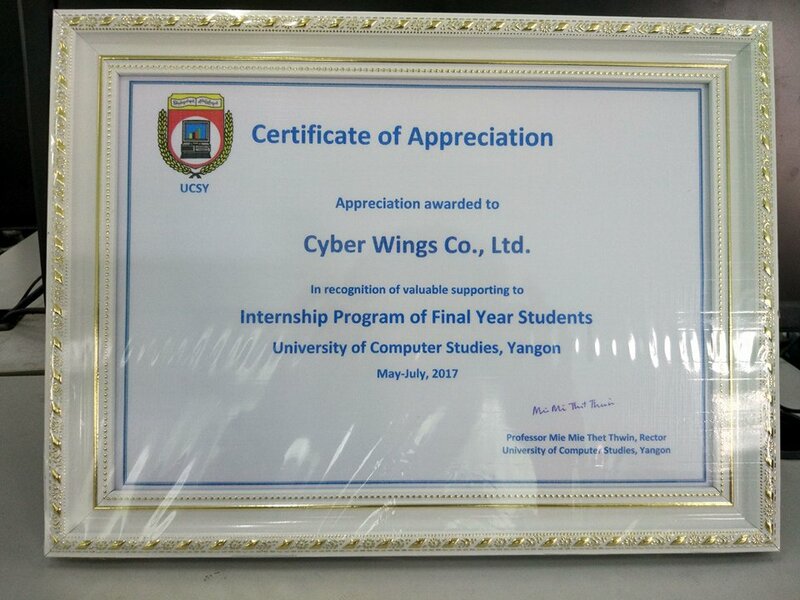 I, Yan Naing Myint, hereby, as a supervisor of Internship students to Cyber Wings Co., Ltd and CEO of it, thank to University of Computer Studies – Yangon. And, let us state that “We are really happy to support the students with the best of our knowledge”. And we, hereby, thank you to the following students of UCSY who were the Internship students to Cyber Wings Co., Ltd. They had done their best during the Internship in Cyber Wings Co., Ltd, which had lasted 3 months.